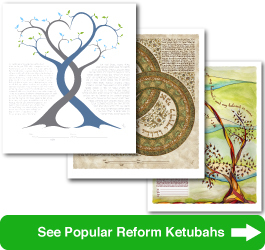 MP Artworks offers six Reform ketubah text choices that may be paired with any of our ketubahs. A Reform ketubah text typically contains two portions: one in English and one in Hebrew (the Hebrew is a direct translation of the English). We offer you the option to choose both English and Hebrew, English-only, or Hebrew-only. Although most couples will choose to have both English and Hebrew, Israeli couples sometimes prefer to have the Hebrew-only text since that is their native tongue, and occasionally Reform couples select English-only. If one of you is not jewish, you may wish to consider one of our Interfaith ketubah texts, which are nondenominational versions of our Reform texts. You may also choose to write your own vows for a completely customized text. On the ___ day of the week, the ___ day of ___, in the year ___, corresponding to the ___ day of ___, in the year ___, ___, son of ___, and ___, daughter of ___, join each other in ___, before family and friends to make a mutual covenant as husband and wife, partners in marriage. The groom, ___, promises ___, the bride: "You are my wife according to the tradition of Moses and Israel. I shall cherish you and honor you as is customary among the sons of Israel who have cherished and honored their wives in faithfulness and in integrity." The bride, ___, promises ___, the groom: "You are my husband according to the tradition of Moses and Israel. I shall cherish you and honor you as is customary among the daughters of Israel who have cherished and honored their husbands in faithfulness and in integrity." "We, as beloveds and friends, promise each other to strive throughout our lives together to achieve an openness which will enable us to share our thoughts, our feelings, and our experiences. We promise to try always to bring out in ourselves and in each other qualities of forgiveness, compassion, and integrity. We, as beloveds and friends, will cherish each other's uniqueness; comfort and challenge each other through life's sorrow and joy; share our intuition and insight with one another; and above all do everything within our power to permit each of us to become the persons we are yet to be. All this we take upon ourselves to uphold to the best of our abilities." All is valid and binding. *Signature lines may be altered at time of order for no additional charge. Text © 1996-2017 Micah Parker Artworks, Inc. This text may not be reproduced without consent of copyright owner. We will be happy to sell a one time license for personal use of this text for $10, or you may purchase an blank digital file for $25 or a personalized digital file for $69. On the ___ day of the week, the ___ day of the month of ___, in the year ___, which corresponds to the ___ day of the month of ___, in the year ___, in ___, the groom, ___, son of ___, and the bride, ___, daughter of ___, entered into the holy covenant of marriage before God and these witnesses and said each to the other: "I betroth you to me forever. I betroth you to me in everlasting faithfulness. In the spirit of Jewish tradition, I will be your loving friend as you are mine. Set me as a seal upon your heart, like the seal upon your hand, for love is stronger than death. And I will cherish you, honor you, uphold and sustain you in all truth and sincerity. I will respect you and the divine image within you. I take you to be mine in love and tenderness. May my love for you last forever. May we be consecrated, one to the other, by these rings. Let our hearts be united in faith and hope. May our hearts beat as one in times of gladness as in times of sadness. Let our home be built on Torah and loving-kindness. May our home be rich with wisdom and reverence." This ketubah has been witnessed and signed according to the laws and traditions that began with Abraham and Sarah and continued through Moses and the people of Israel. It is valid and binding. On the ___ day of the week, the ___ day of ___, in the year ___, corresponding to the ___ day of ___, in the year ___, the holy covenant of marriage was entered in ___, between the groom, ___, and the bride, ___. The groom, ___, son of ___, said to the bride: "I consecrate you to me as my wife according to the laws of Moses and the traditions of our people. I shall treasure you, nourish you, and respect you as the sons of Israel have devoted themselves to their wives with love and integrity throughout the generations." The bride, ___, daughter of ___, said to the groom: "I consecrate you to me as my husband according to the laws of Moses and the traditions of our people. I shall treasure you, nourish you, and respect you as the daughters of Israel have devoted themselves to their husbands with love and integrity throughout the generations." And ___ and ___ pledged together: "We promise to be ever accepting of one another while treasuring each other's individuality; to comfort and support each other through life's disappointments and sorrows; to revel and share in each other's joys and accomplishments; to share our hopes and dreams; to strive for an intimacy that will allow us to accomplish this promise and permit us to become the persons we are yet to be. We vow to establish a home open to all of life's potential; a home filled with respect for all people; a home based on love, understanding, and the traditions of our heritage. May we live each day as the first, the last, the only day we will have with each other. All of this we take upon ourselves as valid and binding." On the ___ day of the week, the ___ day of ___, in the year ___, which corresponds to the ___ day of ___, in the year ___, in ___, the groom, ___, son of ___, and the bride, ___, daughter of ___, joined each other before family and friends to enter into the holy covenant of marriage, and with love and compassion each vowed to the other: "Today I love you completely, as I did yesterday and as I will tomorrow. I will be there for you when you need me most. I will hold you in my heart just as I hold you in my arms. I will share in your dreams, delight in your joys, and comfort you in your sorrows. I will be your confidant, your counsel, your friend, and your lover. When you are not within my sight, you will be within my thoughts. You are my life; you are my dreams; you are my joy; you are my love; you are my everything. At this moment you are all that I know and all that I see. As we grow old together and our love matures, may we hold on to the passion and affection for each other we feel today. Our commitment to each other seals this document." On the ___ day of the week, the ___ day of ___, in the year ___, corresponding to the ___ day of ___, in the year ___, in ___, the groom, ___, son of ___, and the bride, ___, daughter of ___, entered into the holy covenant of marriage before God and these witnesses and made this pledge together: "As we travel life's journey together, we will hold each other in respect, in admiration, and in love just as we will hold each other's hand. We will try always to be understanding and forgiving, sensitive to each other's needs and feelings. We will be there for each other in times of need as in times of celebration. We will share in each other's hopes and dreams and support each other to achievements great and small and through all of life's setbacks. May God be with us and bless us. May the laughter of children grace the halls of our home. May we be poor in misfortune and rich in blessings. May the light of friendship guide our path together. May we see our children's children. May the joy of living for one another bring smiles to our faces. May we know nothing but happiness from this day forward. All of this we accept as valid and binding." On the ___ day of the week, the ___ day of ___, in the year ___, which corresponds to the ___ day of ___, in the year ___, in ___, the groom, ___, son of ___, and the bride, ___, daughter of ___, joined each other before family and friends to enter into the holy covenant of marriage, and with love and compassion each vowed to the other: "Who would I be without you? Without you, I stand on my own. But with you, I stand tall, I have confidence, and I am assured. Without you, I merely exist. But with you, my life has meaning, my years have joy, and my days have happiness. Without you, I am a good person. But with you, I am special, I am inspired, and I am better than I knew I could be. I did not know I could love this deeply, and now, I do not know how not to. I cannot express how much I love you with just simple words. You are the sun in my days and the moon in my darkest nights. You are the brightness in my universe. You are beauty itself. I believe in you, I trust in you, and I have faith that you will always be there for me. You are my champion, you are my counselor, and you are my friend. I pledge myself to you today and all of my tomorrows. I will be with you through times of joy and times of sorrow. I will try to always be understanding and forgiving. You are always in my thoughts and my dreams. My commitment to you, and yours to me, binds us together and seals this document." On the ___ day of the week, on the ___ day of the month of ___ in the year ___, corresponding to the ___ day of the month of ___ in the year ___, The groom, ___, said to the bride, ___, "Be my wife by the consent of the Bet Din of ___ according to the law of Moses and Israel. I will cherish and respect you and work for our mutual sustenance, living with you as your husband." The bride said to the groom, "Be my husband by the consent of the Bet Din of ___ according to the law of Moses and Israel. I will cherish and respect you and work for our mutual sustenance, living with you as your wife ." Bride and groom have promised to establish a Jewish home from this day forth. They have committed themselves to the covenant of marriage written this day between them. The symbolic acquisition by the groom and bride, with regard to everything written and explained above, has been performed. All herein written is valid and binding. *Signature lines may be altered with rabbi's permission at time of order for no additional charge.